silverlight isn't installed on enough machines yet (and it may never be) and it isn't truelly cross platform. moonlight is so far behind the actual release version that you invariably shrug and go "oh well". well, i do anyway. @Pete - Interesting perspective. How important is Linux support to your clients / organization? Obviously, I agree that full cross-plat is an advantage of standards-based dev, but I'm curious how many people really need to support Linux. 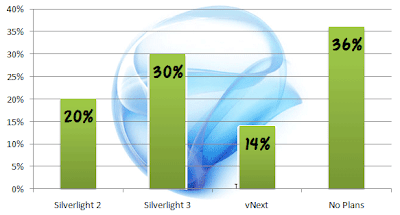 To me, Silverlight is one of those areas where the enthusiasm for technology by developers way exceeds the desire for it by users or practical applications for it with the current internet status. public and government agencies push for cross platform support (especially here in the uk). look at the bbc iplayer for a classic example of what happens when you don't support linux. and in the recession, they're one of the few big players that are still spending. ultimately though, its about more than this. it's taken till v3.5 to get mvc support. webcontrols still produce shoddy markup and we won't be able to control client id's until verions 4 comes out. The point is, MS just doesn't get web development and we have to say to our clients "sorry, can't do that" or spend hours trying to build work arounds. b) Have robust dev tools and offer convincing arguments that it is worth a dev learning yet another set of skills. I don't see either point having been addressed. MS tried a flash beater back in the late 90s (the name escapes me), it didn't work then, I doubt it will now.